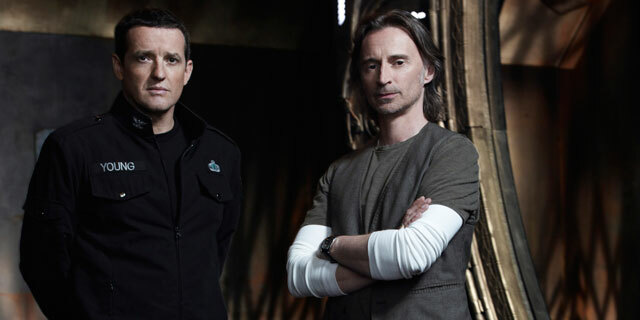 Here is my reasoning for watching Stargate Universe – I thought Robert Carlyle would have been an awesome Doctor Who, and so when that didn’t happen (not that it was ever a serious consideration, but c’mon, how COOL would he have been?! ), and he got cast in another sci-fi franchise, I figured I’d take what I can get. I have neutral-to-negative feelings on Stargate as a franchise. I never watched the movie, or any of the other shows, but I’ve always been a little pissed off at its ability to outlast other, more beloved series (and even casting Farscape’s Ben Browder and Claudia Black and Firefly’s Jewel Staite felt more like rubbing salt in the wound than throwing fans a bone). But on the other hand, I was intrigued by its new-viewer-friendly promise, and again: Hey look, there’s Robert Carlyle! SGU’s premise and style is pretty transparently cobbled together from other varyingly-successful sci-fi shows before it. From Battlestar Galactica it gets the steadycam visual language (and a passing resemblance to Baltar in Carlyle); from Lost it takes the sprawling cast and mystery elements, possibly-sentient-ship is a nod to Farscape, and the castaways-in-space angle has seen play in Voyager, Farscape, and, well, Lost in Space, and that’s just off the top of my head. 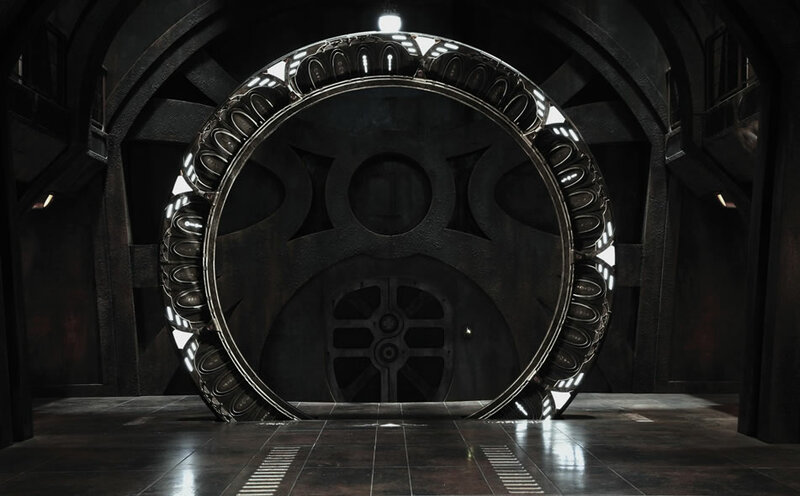 Oh, right – and there’s a Stargate in it. While it’s hardly an original premise, it at least borrows a lot of good elements to play with and can potentially gel into an interesting series. And if the first couple episodes only focus on a few cast members, those characters feel like, well, characters, rather than the shorthand Types that generally show up in a pilot. Or maybe it’s that the actors do a job of imbuing the types with personality and seem like they’re actually thinking about what they’re doing. But I am curious how sci-fi fans in general respond to the tropes that are apparently a major part of the Stargate franchise in general – which are basically “magic objects.” They try to science up the way the stargates operate a bit, but stuff like the mind-switching communication-stones…well, c’mon. They’re magic rocks. I’m cool with that – in fact, I’m kind of happy they DON’T try to come up with a pseudo-science explanation for mystical brain-switching stones (or if they do, we don’t see it – there’s a pretty funny part early on in the pilot where the rookie-science-guy starts fast-forwarding through the tedious briefing videos starring the Science Guy from the SG1 series). But I realize that’s kind of a make-or-break situation for a lot of viewers, so if anyone’s had experience with the Stargate franchise in the past, speak up. Anyway – worth paying attention to. It looks good, it’s well acted, there’s little chance of it getting cancelled in one season (based on SyFy…ugh…based on the network’s previous Stargate history), and it’s got Robert Carlyle playing A doctor, if not THE Doctor. Also Lou Diamond Phillips is in there. I watched 8.5 seasons of SG1 and 1.5 of Atlantis and don’t regret doing so. They almost never had anything I would consider truly original concepts, but the executions almost always showed pep. If they had anything original, it was SG1’s modern day military milieu. That went a long way towards grounding the characters in something recognizable (That silly but watchable UPN show Seven Days got some mileage out of this, too). The other thing they had going for them for long-time viewers was a penchant for referencing characters, situations, and wacky technologies that you assumed would be episodic one-offs later and re-contexualizing them in neat ways. This probably made it impenetrable to new viewers, of course. Finally, on a basic level, the characters were likable, usually well-written, and had convincing relationships with each other. That’s 90% of any show’s success. In a lot of ways I think the SG shows were one of the best “B” SF franchises. They were setting out to make fun, nerdy, action-packed shows and did pretty much that. I think my distaste for BSG was the ham-handed attempts at gravitas when they (IMO) were essentially making the same stuff. There is a tonal danger with the new show, because it’s clearly meant to be A Serious Television Show, but, y’know. Space doors and brain-switching rocks. Also, every time Richard Dean Anderson cameos (I don’t know if that’ll be a regular thing, but he’s managed to pop up for the first two eps), it looks like he’s getting more of a kick out of the situation than, say, Lou Diamond Philips. But overall, I think the first two episodes do a pretty good job of maintaining a consistent tone. We’ll see how that works out, now that the immediate danger of the first two eps has been dealt with (…FOR NOW)! Richard Dean Anderson was the best part of the SG1 series, because there was never any question that he was getting a kick out of the whole thing. I think that’s what sold me on MacGyver, too.